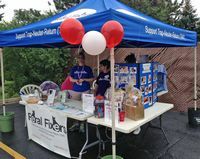 Although the day started out rather wet, the weather ultimately cooperated and it turned out to be a successful day at the 4th annual Shred for Rescues event at Citadel Information Management in Westmont on Saturday, 8/27. We had a short break in the showers just long enough to enable us to get our tent set up. Once we were set-up, there was a brief passing shower, but we all stayed dry under the tent - great timing. Fortunately, the weather cleared up after that, and we had a successful event with a good amount of foot traffic. We were able to position our new adoption sign right by the line of traffic waiting to get their shredding done, so that helped to draw people in. Four other rescues had tents at the event - West Suburban Humane Society, Hinsdale Humane Society, AaRoooo Basset Rescue, and Bow-Wow Rescue. Each of them had a few adorable dogs available for adoption. There was also face painting for the children. Kim provided two beautiful raffle baskets for the event (one with cat focused supplies, another with human treats). These baskets drew a significant amount interest. We will be delivering them to the luck winners today. We also had an assortment of cat magnets, Feral Fixers tote bags, cat toys and blankets which drew in some interest and donations. Sara, Bernie, Lauren and Debbie did a great job of engaging our visitors with information on our adoptable cats and kittens as well as Trap, Neuter, Return advice on the outdoor cats & kittens in their neighborhood. Many people stopped by to view the adoptable cats & kittens posted on our board and in our binder and took cards so they could later contact us. We also distributed flyers and cards to several folks interested in our TNR activity. Citadel was kind enough to put together gift bags which they distributed to folks who brought their shredding which included our cards and flyers. So lots of good publicity! Thanks to Sara's, Bernie's, Debbie's and Lauren's help, set-up and clean-up went very efficiently. Thanks to Sara for doing a great job of the photography and live video from the event. Thanks to Connie for the excellent Facebook coverage. Thanks to Mike for updating our Adoptables binder and to Debbie for updating our Adoptables board. Fiona, our animatronic cat, displayed her alien hat at this event. All in all a successful day! Our next adoption event is Saturday, 9/10, at the Pet Supplies Plus at 720 E. Ogden Ave. in Naperville, from 11am-3pm.